A fight broke out on a plane headed to LAX from Honolulu. That Hawaiian Airlines flight was forced to turn back mid-flight. Darsha Phillips reports for Today in LA on Wednesday, March 20, 2019. 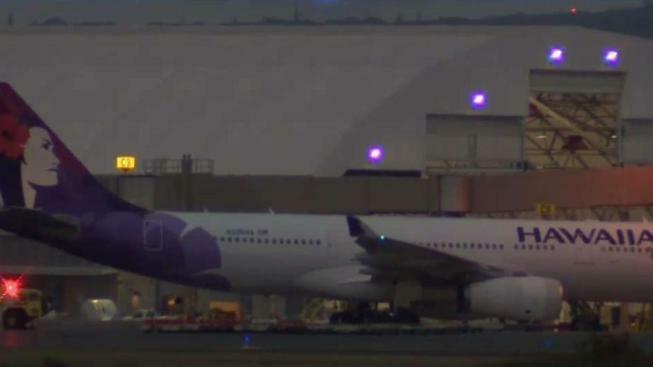 A Hawaiian Airlines flight to Los Angeles returned to Honolulu due to two "unruly passengers" whose mid-air squabble forced pilots to turn back two hours into the trip. The aircraft departed from Honolulu at 2:50 p.m. on Wednesday. Passengers said one man apparently bumped another, touching off the shouting match. "Some dude in another dude's face," said passenger Justin Moore-Brown. "Had his finger all up in his face, telling him to f--- off." There were 276 passengers and 11 crew members on board. The plane was met by law enforcement in Honolulu at 6:38 p.m. One person was escorted from the plane. "Safety is our priority, and we apologize to our guests for the inconvenience," Hawaiian Airlines said in a statement. The flight then departed to Los Angeles at 8 p.m.